Materials: Viking Vår yarn yarn (100% cotton, 50 g / 85 m.) - 14-16-18-20 skeins, knitting needles 3.5 and 4.0 mm. Density of knitting: 20 loop = 10 cm. Width of the front surface of the spokes 4.0 mm. 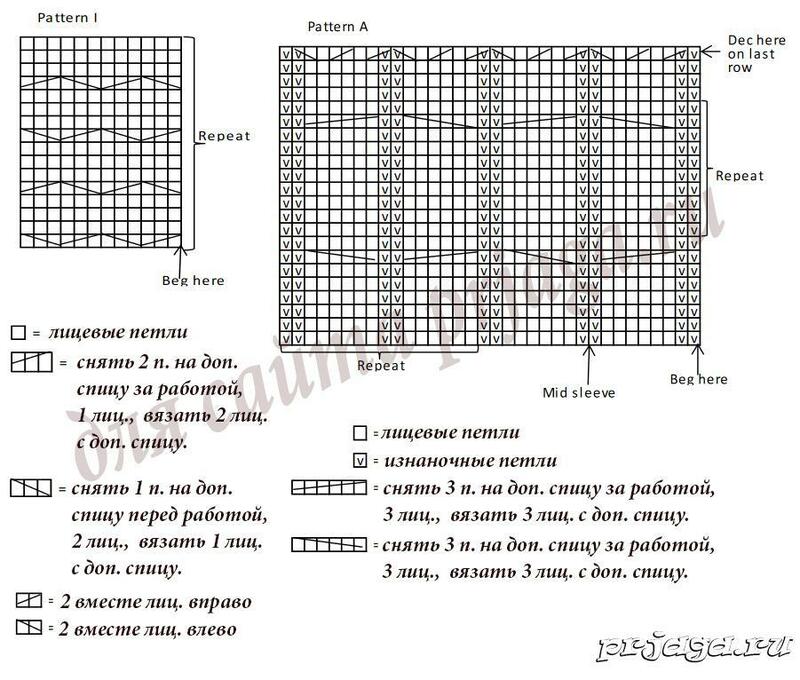 Pattern 1: knit according to scheme 1. 2nd row: * knit a loop three times (1 face. For the front wall, 1 face. For the back wall and again 1 face. For the front wall), 3 faces together, repeat from *. The back and front: 3.5 mm knitting needles. dial 192-208-224-240 loops. Then knit gum: 2 persons., * 4 out., 4 persons., Repeat from * 4 out., 2 persons. Go to the needles 4.0 mm. * Knit a series of face loops, at the same time add 0-2-4-6 loops along the first 18-22-26-30 loops (= 18-24-30-36 loops with pattern 1), add 2 loops evenly along the trail. 10 loops (= 12 loops pattern 2), add 26 loops evenly along the trace. 40 loops (= 66 loops of scheme A), add 2 loops evenly along the trace. 10 loops (= 12 loops with pattern 2), add 0-2-4-6 loops along the last 18-22-26-30 loops (= 18-24-30-36 loops with pattern 1), repeat from * once more for the backrest = 252-276-300-324 loops (126-138-150-162 loops for the back and front). At a height of 38-38-38-39 cm. Divide the loops on the back and in front. Continue to knit back and in front of separate parts. Back: knit to a height of 60-61-62-64 cm. Then knit a number of facial on all the loops, at the same time to subtract: to subtract from loops to get 98-106-114-122 loops evenly along the row. Remove the central 42 hinges for an additional needle for the neck of the back. Close 28-32-36-40 shoulder loops on each side. Before: knit like a back, without the last 7-7-8-8 cm. For the neckline, put the central 48 loops on an additional knitting needle. Then continue to knit as a back, simultaneously closing 3 loops on each side of the neck in each second row - 1 time, 2 loops - 2 times and 1 loop - 2 times. Finish shoulders like the back. Sleeve: 3.5 mm knitting needles. dial 32-32-40-40 loops. Knit with a rubber band as before, starting from 2 persons. loops. Knit a number of facial loops, at the same time adjust the number of loops under 56-56-64-64. Knit pattern A, at the same time add on each side (at the beginning and at the end of the row) one loop every 1 cm. Until you get 128-128-144-144 loop. Tie sleeve to a height of 48-50-51-52 cm. Knit a number of facial loops. Raise 106 loops evenly along the neck (including deferred back loops and front). Knit a series of facial loops at the same time add 6 loops = 112 loops over the central loops of the neck before the loop. Knit with a rubber band as before - 24 cm.